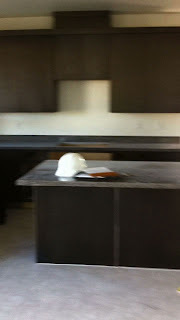 kitchen comes to an end | . stephrything . We finally tiled the backsplash. The kitchen is finished. Before the move we scored this glass/marble tile for $6 a sheet at Bedrosians. We found it in the "seconds" section (normally goes for $15-20 a sheet), but despite some areas of inconsistency or discoloration, it looked pretty good. We knew we wanted it in our kitchen so we bought five boxes. We had no idea what we were getting ourselves into. Prep work. Brent and I taped paper over our countertops and filled in wall holes (from the old backsplash tear out) to make it easier for the thin set and tile to adhere to the wall. I made two or three trips to home improvement stores. Brent cut a 1x2 ft hole in the wall, moved the electrical unit and wiring, and installed studs to support the range hood. 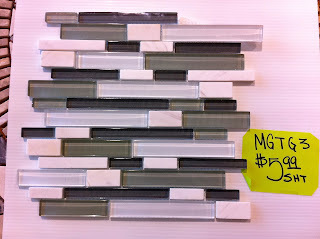 And we found the only store in Vegas open later than 5pm on a Saturday that carried a glass tile blade for a wet saw. Miracle. We finally got started at 8:30pm that night. We finished this section at 11:15pm and went to bed. We spent the next several days installing more tile. 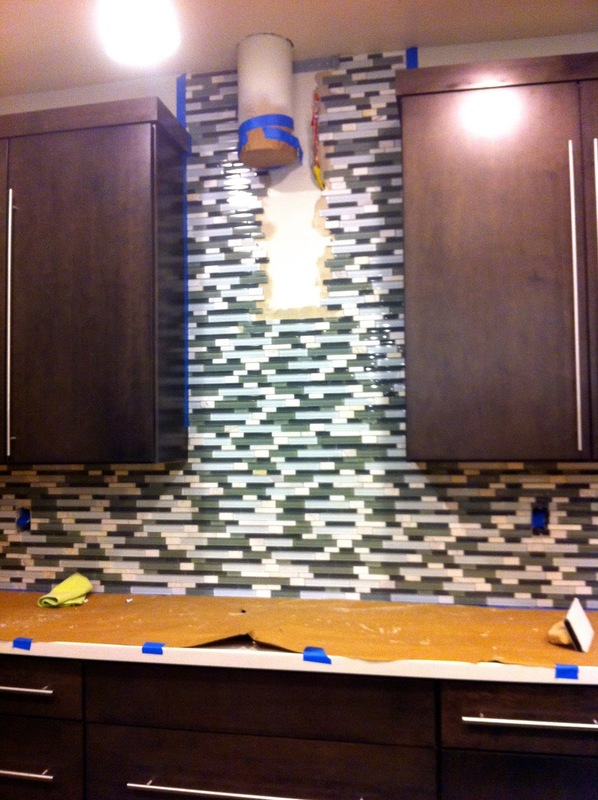 We got to the other end of the wall and realized we needed to buy more tile (to finish where the hood would go). Grouted the tile. What a mess. epilogue: I may have been without a stove for two weeks with the rest of the kitchen as a construction zone, but it was worth it.